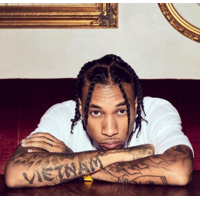 Michael Stevenson (born November 19, 1989), better known by his stage name Tyga, is an American rapper signed to Young Money Entertainment, Cash Money Records and Universal Motown Records. He first received recognition with his debut single "Coconut Juice". He is nominated for a Grammy, with Chris Brown for "Deuces", for the 2011 Grammy's.